After a HUGE year of exhibitions, media, retreats and events I decided to take a bit of a sabbatical, I thought I’d drop in and leave a little hint of the direction my work will be heading in the coming months. The concepts are solid, however there was some artistic play before my break and I’m sure that will continue when I return to the studio. I’m enjoying the uncertainty of not knowing how the final piece/s will look and delight in the freedom after the rigidity of the last 10 years making Self Portrait; Artist’s Brain. The brain-mind conundrum has long been the subject of debate and speculation amongst scientists and philosophers. In recent times, however, a new player has been unmasked, the enteric nervous system in our gut; nicknamed ‘the second brain’ an often-overlooked intricate network of some 100 million neurons and a rich microbiota. The systems of the brain/gut axis have a bidirectional relationship influencing health, mood and behaviour. Householders share a rich array of their microbiome with each other. There are dynamic interactions between us and our housemates and even our pets. A shared internal ecosystem. This installation draws inspiration from this complex exchange; exploring the unexpected and unintended intimacy between cohabitants. I have a few works in progress at the moment. Of course there's Big Red. I was going to go against my usual slow art policy and sprint this one through but I have come to my senses and am taking it slowly. Enjoying the process and the passage of time. The following image is of my desk while I'm developing a new stitching technique. "Is it meant to be that ugly?" I've decided to name it 'Grouse Point' (Grouse is Aussie for great/terrific). I'll give the technique its own dedicated blog post when I've refined it a little. This piece is currently at the framers and also deserves a post of its own. Some of the stitching was done in the Malaysian jungle while I was watched by monkeys... but there's so much more. Oh, and its gilt in 23 karat gold. Whaaaaa? This is the subtle palette I've been playing with over the recent long weekend. I’ve also been busy writing didactic panels for an exhibition of prisoner artwork and poetry which I’m coordinating for Liberation Prison Project. I'd call it curating but that's not really what I'm doing because I'll let any of our artists participate and show their work. The work will be exhibited at the University of Western Sydney in February. See here for more info. It’s heart wrenching to edit our students stories and I’ve been reliving the time surrounding the execution of two of our U.S students/artists. The feeling of helplessness came flooding back... a time when no one wins. Sometimes I think that maybe I'm not cut out for this work but there is a reward in helping people who are making an effort to change their habitual patterns, work on their minds and take responsibility for their actions... it’s rewarding work, I won't deny that it is also difficult. At times my heart is so heavy it hurts so I’ve allowed myself time to procrastinate with moments as a maker and moments of music. I sit and fumble at the piano my fingers tangled and my cello bow is broken (I’m sure my neighbours are grateful). I will finish the final edit today then back to the studio to work on Big Red. Let’s look out for each other. I think it fitting to finish with this work in progress by Luke, one of our prisoner students. His story is particularly moving and will be featured in one of the exhibition panels. 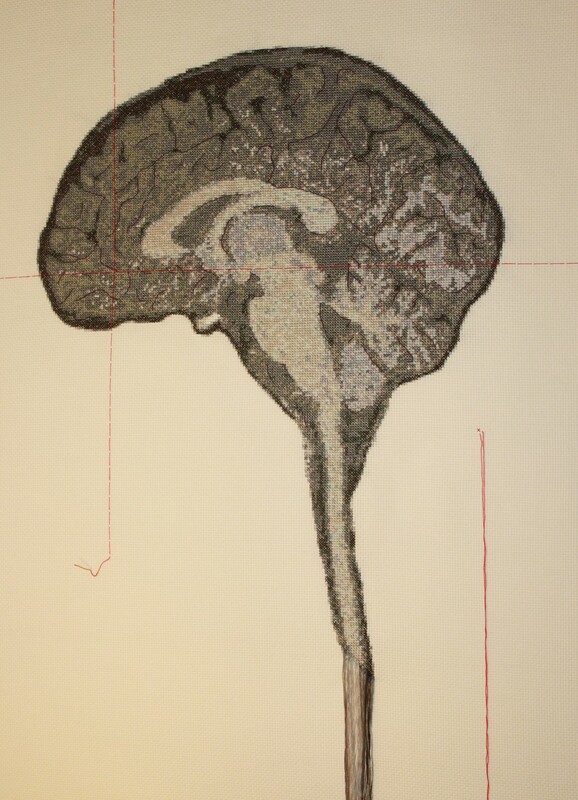 170 hours of stitching and 22,569 stitches later (45,138 if you take into account that each stitch is a cross) Self Portrait; Artist's Brain #4 (unofficially known as 'Pea Brain 4 Eva') is complete! The piece just can't be documented properly before it's stretched so here are some preliminary images. I decided to back-stitch the sulci freehand which was a bit of a risk, but I'm pleased with the result. I chose a deep shade of purple of which there are already 14 stitches scattered through the body of the work as well as part of the brain stem. Here's a little video of me stitching. If you could see the world through my eyes, this is what you'd see. Hours and hours of this. After the completion of the stitching came the process of finding a Picture Framer. I am super worried about stretching the piece so I asked around for recommendations from other artists. It's largish for a cross stitch (1m x1m unframed) with heaps of exposed Aida (think lots of holes with strong vertical and horizontal lines), it also has a bright red vertical and horizontal line and a hangy brain stem which pulls on the fabric so it really needs to be stretched by someone who knows what they're doing. I ended up getting three quotes from the trusted recommendations I received which all came to within $200 of each other. I went with my instincts and am having the piece framed by Rod Denson and Sarah Edmondson at their framing studio in Alexandria. I'd briefly met them a few weeks earlier at Tom Polo's farewell party before his Big European Art Journey. Sidenote: I'm so very pleased to see Tom kicking goals, he's a prolific painter, brilliant artist and a joy to be around. I am proud to call him my friend. After speaking with Rod, I just know I made the right decision. He was happy to spend time with me, talk to me and offer expert advice about my options and even answer my non-related framing questions. Rod and Sarah both come from a graphic design and art background so I feel confident leaving my brain in their skilled hands. I'll have the framed piece back in my hot little hands in a few weeks, I cant wait to see it in all its framed glory. I wish I'd planned ahead and finished my current piece today. Oh well, watch this space, it's not far away. 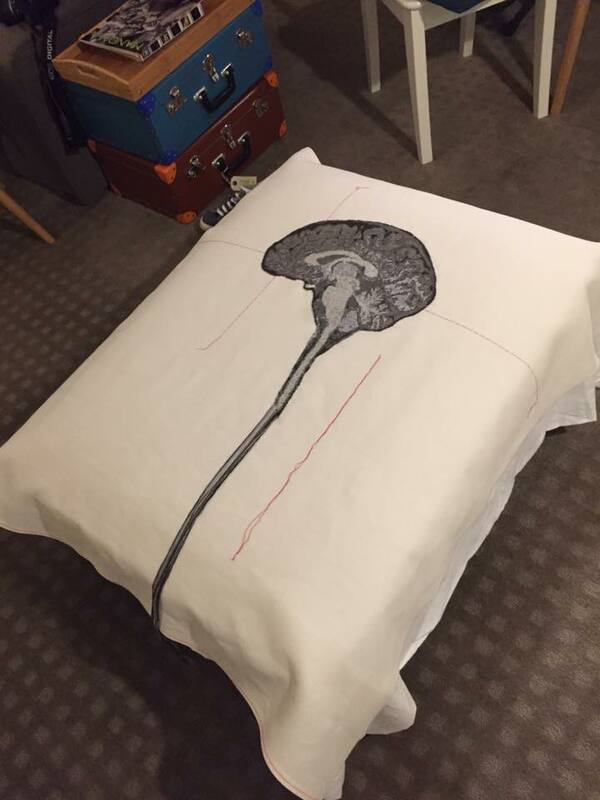 Here's a work in progress shot of my fine brain. 150 hours of stitching so far. I belong to the it doesn't have to be neat as long as it's flat school of embroidery. In this next image you're lookin' at the back of my brain, things get pretty messy in there anyhow. A bit of honest Xstitch. I have just finished writing a proposal for a site specific installation for a multi site festival. I managed to submit my entry with 40 minutes to spare. Phew. Up until last night I had decided against applying, however I awoke with renewed enthusiasm and I'm pleased that I made the effort. The artwork signifies the transformation of laneways from cold and utilitarian spaces into a vibrant cafe culture disctrict (not unlike my beloved Melbourne). I should find out if I'm shortlisted by Friday. Looking at Brain Art on Pintrest, I came across my own work with this inspiring critique. Love it! I love it, truly. The work has had some sort of impact on this person, enough for them to save it and write something. It's honest and it made me laugh. The same piece was pinned by a few other people but they didn't caption. This person made an effort. I have been invited to present a meditative cross stitch workshop as part of the WeAve project at Parramatta Artists Studios. See the events page for details. The workshop is free and everyone is welcome so come get your stitch on. 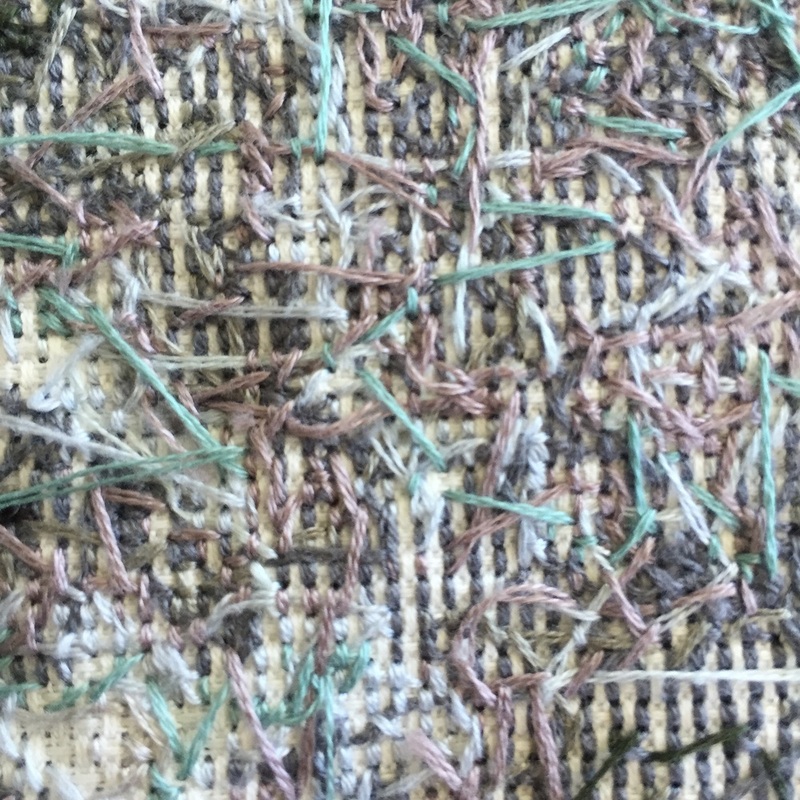 WeAve connects culturally diverse people through textile art, with a focus on contemporary practice accessing traditional methods. I plan to start the day with an artist’s talk focusing on my slow art practice, then leading the group in a short meditation before we get down to stitchin' (and bitchn' yo yo yo). I had originally planned to use a woven piece made by WeAve as the inspiration for the pattern but in the end I went with a stylised map of the Parramatta CBD which will link nicely with the meditative aspect of the process (A loving kindness meditation focusing on location). The map will be divided into small sections, each an abstract art-piece in its own right. Once the completed patches are viewed together the map itself becomes clearer to the viewer. The pattern making was a two-day process and I’m totally in love with the result. A stylised map of Parramatta using the Parramatta Artists Studios signature pink for the roadways. A simulation of the final project which will be completed in small sections by each participant. After a break from stitching while I made new work for exhibition, it is nice to be back working on this piece. Having a small break makes it all seem manageable again. So far I've stitched for over 106 hours. I have also been sketching toward some paintings I'd like to work on, unfortunately my current studio space isn't suitable for painting. I'll keep planning and hopefully something will come of it. It's been a long while since I picked up a brush. Am I Too Dumb to Refine? I have so much to say on this matter and I don't really know where to start so I'm going to ramble. I fixed my website which looked like it was straight out of 1998 and I hate it already, sooooo 2015. I don't think I'll ever work out small talk and 'networking'. I find art events challenging, particularly the fractured conversations, I feel as though I'm either interrupting or being interrupted. A big-shot art dealer once felt me up while we had our photo taken, or more to the point, I was assaulted in an extremely intimate assertion of power and control while I stood there and smiled for the camera. Needless to say I didn't sign with that gallery and ever since then I have difficulty talking to art dealers/curators and pretty much anyone who can help with my "career". It’s not that I think other art dealers are going to ‘cop a feel’, just that ever since then, I think that I unconsciously believe that my work is shite because that one dealer had ulterior motives. I was young and impressionable and straight out of art school and the feeling stuck. The following sentence makes me angry: "Theory and discussion will explore perspectives on materialisation embedded in the logic and phenomenology of digital and analogue substance" (COFA). I hate 'artspeak'. My work is still "arrrty crrrafty". I always cry after openings (I have an opening tonight). So far this year I have earned $500 which I then spent on materials. If it wasn't for my partner, I'd be destitute. (I deleted all the swear-words). I love what I do. Truly. In the past, I tried to stop making work, I've never been able to give up. My plan now is to just keep plodding along and if one day I'm a 'successful' artist that'll be a welcome surprise and if not, that's OK too. Also, I should add that I admire the artists I know who are able to shape-shift to fit into the expected 'professional artist' box. I know that many find it challenging. Showcasing my 'Professional Artist' persona at the Parramatta Artists Studios 2008. Snuggling with artwork by (the brilliant) Linda Brescia, draped with lights and a glass of cask. "When I was working in the north in my youth my grandmother used to make cakes and post them to me the way she had done with her husband, my grandfather, during the war. She would fit them into a tin and stitch the tin shut with calico writing my name and address in indelible (purple) pencil on the outside. This came up in conversation last week when I met with a 98-year-old widow of a decorated Australian naval veteran. It was something she hadn't thought about for 75 years and was delighted at the recollection. It inspired several hours of very pleasant reminiscences." The team at the State Library of NSW were also fantastic with numerous Librarians phoning and investigating which of their collections would be of most use. I also received assistance from the research centre of the Australian War Memorial who sent links to their digitised collection saving me a trip to Canberra. First rough sketch for the installation. The piece will explore the role of women sending letters and care packages to loved ones serving overseas. Preliminary research for the new work. Looking forward to is getting my grubby (but gloved) fingers on three crates of papers, pictorial materials and relics from the 'Special & Restricted Collections' of the State Library of NSW. Having spent many hours in grand and hidden reading rooms of the State Library of Victoria, this was my first foray in the Mitchell Library Reading Room, Special Collections area of the State Library of NSW. I felt as though I were discovering long lost treasure, see below for a list of some of items I came across in my research. Cordoned off with a glass wall, the special collections area was not the dark, lamp lit, back-rooms I remembered from Victoria. It is however much more practical, well lit with power points for laptops and large wide desks for spreading out my treasures. The Librarians were so very helpful, dragging out the crates I had ordered from offsite. "Oooh, that's a heavy one, be careful lifting that"
At first I found each authors handwriting arduous, being a child of the digital age, cursive script is not something I come across often (even in my work with the 'pen pals' at the Liberation Prison Project). There was no email trail in 1915. As I settled in to a pile of letters, I'd slowly get to know the script and the author. You can learn a lot about somebody by their personal letters, particularly considering that they wouldn't have imagined them being read 100 years later by an artist in a Library reading room. Each writer has a style and a language, a sense of humour and in wartime oh so much heartache. Much of the story is told between the lines. I'd often find myself reading years of letters in the space of a few hours. Sometimes these letters would STOP abruptly. I'd then find myself scrambling through records only to find the dreaded 'Missing in Action' telegram or list of casualties. Heart. Broken. A passport from 1916 with space for a photograph of the 'Passport Holder' and another for the 'Passport Holder's Wife'. Correspondence in this envelope need not be censored Regimentally. The contents are liable to examination at the Base. I certify on my honour that the contents of this envelope refer to nothing but private and family matters. Xmas, I don't know why I thought it was a modern abbreviation, I only saw the formal term 'Christmas' a handful of times during my research. On further investigation the term Xmas has been in use since the 16th century. Carbon copies. As letters would regularly get lost in the post during wartime, some service personnel would send multiple copies of the same letter home. Envelopes were often scarce so it would have been quite an investment to do so. Lists from the Australian Comforts Fund, which was formed at a grass roots level by women to provide 'comforts' and little luxuries to Australians serving abroad. Lists of items included: tobacco, cakes, puddings, condensed milk, sugar, biscuits, newspapers, socks, pyjamas (for the injured), games, pianos (for hospitals) and other 'luxury' items to supplement the Australian soldier's army rations. Although numerous collections are available from nurses serving abroad there is a distinct lack of the female voice from the home front, therefore only half of the story is often told. Understandably, letters from home would have been challenging for the soldiers to keep (although some do mention that they kept all letters). I am a slow art practitioner. Each of my pieces requires extensive time to complete and therefore collections can be years in the making. I was thinking that It may be helpful to my practice to have a place to document the process and progress of each piece, as well as any side projects I may have going. So this blog is born. I don't plan to spend hours nutting out explanations of what I am doing and why, I am not a writer. I hope this can be a place for a few scrawlings and images of my works in progress. Time will tell. After years of silent work, why a blog, why now? With the opening of The Blake Prize slowly fading into memory, the resounding feeling I have is that I am humbled that my work was chosen to hang alongside those of such talented and varied artists. It seems a fitting time to come out of my shell. Just a little. I have dealt with some significant illness over the last few years, so having my piece in an exhibition of spiritual work feels like a turning point. I have come to realise that I just want to make work, so that is what I'm going to do.